Bill Summers and Adam Hartman discuss Early College offerings with PCC staff members. Last week our first summer school reading academy culminated as students completed a battery of tests to measure growth achieved using the Lindamood-Bell Seeing Stars intervention process. I look forward to the post program data so we can see just how much our students grew. Every bit as important as this student growth, 20 Cañon City Schools teachers and literacy coaches logged nearly 1,000 total hours of Seeing Stars instruction and other daily professional development as part of this process. Now, they will be able to take the skills they have learned and use them in daily instruction as well as in intervention sessions conducted throughout the upcoming school year. Just as exciting, on Monday August 8th another 35 staff members will embark on Lindamood-Bell Seeing Stars and Visualizing and Verbalizing training in replication of this first step of our process. At the same time we operated our first summer reading academy, many dedicated staff members conducted an extended school year program for our special education students. This focused on reading, math, and general academic strategies. I know my communication focus has been on our new summer reading academy, but I want to take a moment thank our ESY for giving up precious summer break time in service to our children and their families in this effort. A shout out to our staff at the district warehouse who have taken on the task of sorting through tons of boxes related to our new Journeys reading materials adoption. These resources were purchased as a result of our Early Literacy grant award and are starting to arrive at our school campuses to be accessed by classroom teachers. It takes great people to run an effective school district and so many of ours proudly work in the background putting resources our teachers need in place so they can make a positive difference to our students. Thank you so much! On Friday afternoon CCHS principal Bill Summers, director of instruction Adam Hartman, and I attended a meeting with Dr. Lana Carter, Eric Ingmire, Kathy Herrin, and key Pueblo Community College partners to discuss the start of our new welding program partnership and to refine processes for enrolling students and offering Early College coursework. Cañon City High School has 20 teachers certified as dual high school and college credit instructors including Marcy Epperson, Scott Witkowski, Mark Heinen, Duff Seany, John Duston, Paula Peterson, Lisa DeBuano, Eric House, Lori Coppa, Jake Hogan, Tom O’Rourke, Pierre Ganache, Nathan Bohlken, Jamie Boring, Josh Race, Andrew Fisher, Lora Eslick, Kristi Cushman, Jessie Daniels, and Rachel Lyons. Additionally, 3 more teachers have committed to complete graduate coursework so they can join this list. What a luxury it is to have such qualified people right on our high school campus who make it possible for students to get a head start on college at virtually no additional cost. Cañon City High School’s partnership with Pueblo Community College is truly an example of excellence. Former TOSA Scott Morton and new TOSA Kelly Albrecht sharpened their instructional craft at Theory Into Practice training last fall. At our board of education work session on Monday we will hear from CCHS principal Bill Summers about his plans to gear up the high school to implement a pathways education model, and preparations being made to align high school instruction to the new Colorado graduation requirements that go into effect for the class of 2021. During our open meeting, operations manager Jeff Peterson, finance director Buddy Lambrecht, and I will present a number of options the board might consider more deeply as it works to offer more clear guidance on how to plan for the future use and facilities upgrade in the school district. We invite all interested community members to attend this discussion that should begin sometime between 5:30 and 6 PM. During this week we will welcome new certified staff members through an orientation process guided by director of human resources Misty Manchester. As stated above, roughly 35 of our teachers, instructional paraprofessionals, and principals will also be trained in Lindamood-Bell Seeing Stars and Visualizing and Verbalizing interventions. On Friday all K-5 classroom teachers who have not yet done so will receive introductory training on how to use our new Journeys reading resources. Another focus of our work has been ensuring all our schools have the instructional leadership and student support resources necessary to operate effectively. To do so we have hired a number of Teachers On Special Assignment (TOSA). Last year Cañon City High School and Cañon City Middle School each already had a TOSA in their building, with CCHS’s focused on attendance, teacher evaluation and support matters, and CCMS’s serving as a dean of students who also focused on improved teacher instruction and evaluation. An additional benefit of TOSAs is growing future building leaders. Scott Morton, who served at CCMS and CCHS during the last two years, was chosen by staff to fill the role of Cañon Exploratory School principal in part as a result of experience he gained as a TOSA. Jesse Oliver served as CCMS TOSA last year and will continue in that important role this year. Because of our opportunity to compete for an Expelled and At-Risk Student Services grant this spring we redesigned the CCHS TOSA role to focus on implementation of a more structured student discipline code that includes an alternative to suspension program. Former ROTC instructor Andrew Ornelas was hired into this new position at no additional cost to the district because of our receiving the grant. Many have noticed TOSAs have been added to the staffs of Washington Elementary and Harrison K-8. We made a decision this spring to hire Kelly Albrecht to support teacher evaluation and administrative supervision at Washington Elementary School because, at over 400 students, it is by far our greatest elementary level administrative challenge. However, because we also looked closely at grade level populations, we were able to add her position at no additional cost. Harrison K-8 had a similar issue. At well more than 700 students combined in grades K-8, Harrison houses both our 2nd largest middle school and our 2nd largest elementary population under one roof. With this many students and only a principal and assistant principal on staff it has become difficult for administrators to focus their effort on improvement of instruction. However, after taking a close look at staffing needs, principal John Pavlicek and assistant principal Brian Sprenger were able to propose a plan that secured enough staffing dollars to add Sheryl Wiseman as a TOSA who will focus on student discipline. Thus, at no additional staffing cost, Harrison now has added a person who is expert at addressing student behavior matters, allowing John and Brian to offer teachers the coaching support they need to improve student learning outcomes. Paula Buser updated principals on school safety items at our leadership team meeting. I began this week touching base with RE-2 superintendent Rhonda Roberts. 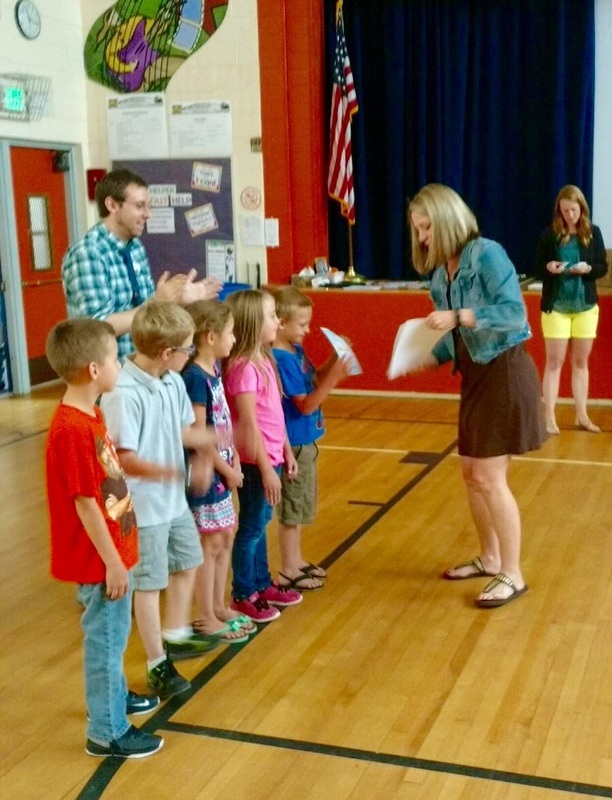 Later on Monday I brought Cañon City Daily Record reporter Sarah Knuth to observe our Lindamood-Bell Summer Reading Academy. I also met with CES principal Scott Morton about developing a rubric to measure his school’s success in teaching to the exploratory model. I then worked with district literacy coordinator Gina Gallegos to prepare for and conduct a building leader PLC session. On Tuesday I began my day at KRLN radio, the had a superintendent advisory council meeting. I also met with the folks at our district maintenance shop about budget issues. On Wednesday I attended our monthly admin office team meeting, meetings about budget items and grant implementation, a meeting with our district nurse Patricia Sallie, and then I travelled to Denver to participate in my first event with other members of Colorado’s Early Childhood Leadership Commission. On Thursday I met with a Channel 5 News reporter about our facilities discussions in the morning and then conducted an administration leadership team meeting in the afternoon. Friday brought about a series of routine meetings, including a monthly touching base session with director of special services Lynnette Steinhoff, and a meeting with Dr. Lana Carter's staff at the PCC Fremont Campus. On Monday morning I'll meet with Dominic Carochi about some special projects he is working on for the district through the use of our Title II funding, and then I'll prepare for and attend a board work session and regular meeting. On Tuesday I meet with CCPD, and my Superintendent Advisory Council. Wednesday and Thursday will be filled with Visualizing and Verbalizing training for me, along with a Cañon 2020 session on Thursday evening. So far I have a fairly light schedule for Friday, though I am sure that will change during the week.